A few facts about my recent FABULOUS discovery (which I made here) . 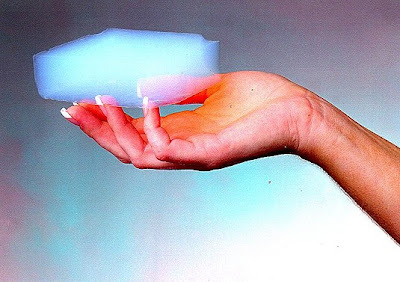 . .
Aerogel (shown above) is the lightest solid known to exist. It weighs only three times as much as air. It's also called frozen smoke because of its hazy blue appearance. It holds 15 entries in the Guinness Book of World Records. When handled, Aerogel feels like styrofoam. It's chemically similar to glass, and shatters like glass, yet is incredibly strong and can support thousands of times its own weight. Woah! This, like, just showed up! No way! Sorry, I haven't read it yet, I was just looking through all the pages and when I looked on this one again, this one just popped up! Cool! Where can you get it??!!?? Oh, wow! What is it used for? ooh should i add that 2 my christmas list????? what would i do with it??? I love how the hand has rreealy long nails. it looks realy pretty. i wander if they could make jewelry ouit of it. I don't actually know. Huh. Well, I'm adding this to my wishlist of stuff I've seen here, just like mini pigs and the shocking jacket (remember those?). Wasn't that in Popsci magazine a while back? I found it after random searching on the internet. Later on, after I requested, we learnt about it in our school's science club. I remember reading about this somewhere a few months ago, it might have been under one of your posts that had a youtube link. Under "related videos". huh. I love how you have the list of facts, and then Aregol (sp) is awesome. If you are interested in this stuff, have a look at www.quiverblog.com. 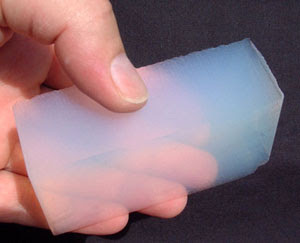 aerogel will change the world. they discovered something that is almostt as light as air,can be held and is SUPER cool, and all you can think about is nails?!?!? yeah its awesome! who woulden't like that??? steal some from the tech museme in san jose.